The title superhero began his life way back in 1939 with the fledgling Fawcett Comics, which wanted to take on Superman, born a year before. 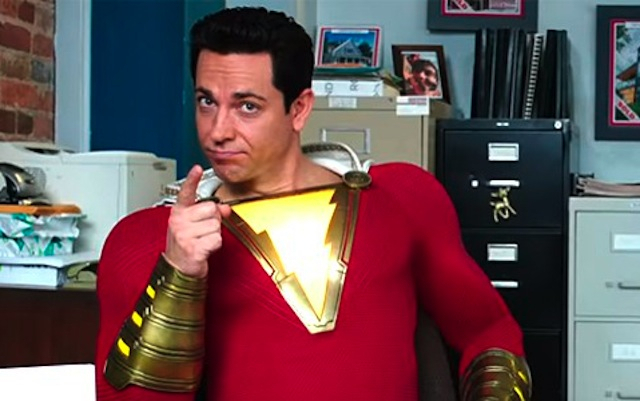 Captain Marvel was his name, and he converted from crippled newsboy Billy Batson with his magic word “Shazam!” (an acronym for the god powers of Solomon, Hercules, Atlas, Zeus, Achilles and Mercury). DC eventually bought the rights in 1972, and redid Captain Marvel as “Shazam,” making the new name permanent in 2011. This film uses the 2011 origin, that Batson is part of a foster family that also can change with the magic word. The origin and his first assignment is nicely balanced for a change, but the evil in the story isn’t as interesting as the beginnings. The overall film is fun, geared I believe more toward kids, but the story is flat and ordinary. Billy Batson (Asher Angel) is a troubled foster kid, who can’t seem to land in a family that suits him, and he is obsessed with finding his real mother. He is placed in a new home that includes Freddy (Jack Dylan Grazer), a handicapped kid who is obsessed with superheroes. Billy defends Freddy in a bullying incident, which begins a strange trip for him. He gets into a subway in Philadelphia, which transports him into Rock of Eternity, and he meets the wizard named Shazam (Diijmon Hounsou). The wiz tells Billy to say his name, and it transforms him into a superhero (Zachary Levi). Batson is now inside the adult hero, and is freaking out. It will up to Freddy and the rest of his foster family to guide him through his new power.